Turn your laptop's USB Type-C port into four USB Type-A ports (5Gbps) using this bus-powered hub. Here's a must-have accessory if you have a USB-C™ equipped computer but need more USB-A ports. 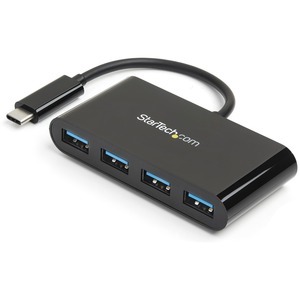 This portable USB 3.0 hub expands your laptop or desktop connectivity by adding four USB Type-A ports through a single USB Type-C™ or Thunderbolt™ 3 port. And, because it's USB bus-powered, you don't need to connect an external power adapter, which makes travel more convenient and workstations less cluttered. If you're looking to extend the life of your existing USB-A peripheral devices, then this hub is the perfect solution. By converting your computer's USB-C port into four USB-A ports, you can continue to use all of your existing USB 3.0 devices such as flash drives, external hard drives, and printers (USB 3.0 is also known as USB 3.1 Gen 1). Now you can save money by avoiding the added cost and hassle of purchasing new USB-C equipped peripherals. This versatile USB-C hub is bus-powered, which means it draws its power directly from your computer's USB-C port. This means there are fewer cables to carry with you when you travel because it doesn't need an external power adapter.